For over 25 years now, Travelpro has dedicated itself to innovation, design, and durability in the making of top-notch, high-quality luggage for the people who love to travel. In 1987, at a time of increased airline travel, Travelpro luggage started when the Original Rollaboard luggage with wheels was invented by a 747 pilot from Northwest Airline. And with that came an innovation that transformed how people travel today in a dramatic way. From executive computer briefs to suitcases and garment bags, totes, rolling duffels, and backpacks, Travelpro has been the favorite brand for more than half a million frequent travelers and flight crews all over the world. 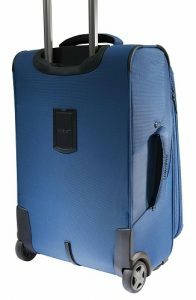 Travelpro customers are grateful for the outstanding stylish innovations, durability, and practical functionality that is the legacy of Travelpro to this day. The Maxlite 4 is among Travelpro’s premiere series of luggage. It is roomy, easy on your wallet and extremely lightweight. There were no drastic changes from the previous Best Buy winner model, the Maxlite 3, which makes it likely that you will love this advanced model if you have used the Maxlite 3 in the past. It comes in a number of designs from two large wheel and four wheel spinners to softside and hardside options. 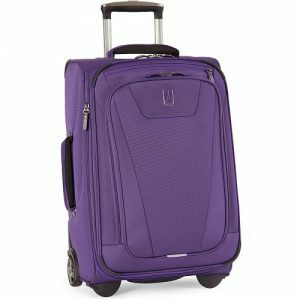 The Travelpro Maxlite 4 comes in several colors to choose from and is relatively a simple bag in that you do not have to choose your luggage to make a statement when flying. It is nondescript but carries a professional styling with it. This is fundamental because it uses the tried and tested four wheel spinner design as well as the oldschool two wheel styles with handles on the side and top as well as an exterior pocket for additional storage. The four color options include: Purple, Ocean Mist Blue, Merlot and Black. After months of testing, and this is the tip of the iceberg, there is a reason why the Maxlite 4 is a very popular set of luggage. There are times when it’s better to be straightforward and basic and Travelpro nails it with the Maxlite 4. We highly recommend this bag if you are not overly concerned about looking cool or super chic. This bag gets the job done without turning any heads. A design that is simple but classic. The spinner sizes can add about two inches to the height for external measurements including wheels but I have never had a problem with using the carry-on spinner in the overhead bin. 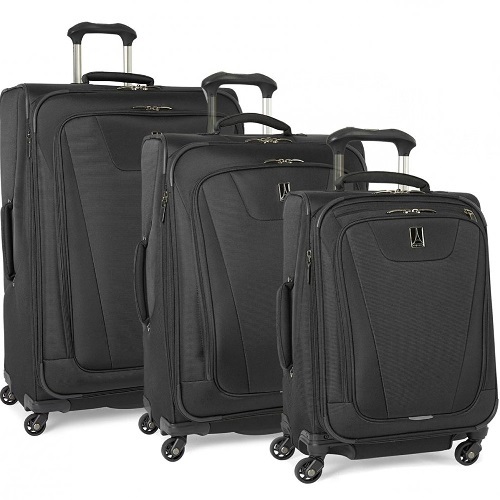 This extensive collection features numerous Rollaboards and Spinners both of the hardside variety as well as the international with the quality and looks of a more expensive luggage bag. For more comfort with these luggage pieces, Travelpro included a patented contour grip with telescoping handles with length stops at thirty-eight inches and an extra tall forty-two and a half inches. The Maxlite 4 features a honeycomb system that’s integrated with a bottom tray to provide a lightweight durability that’s outstanding. The ergonomically designed zipper pulls that are high tensile continue a flawless operation throughout the product’s life while the self-repairing zippers provide consistent closure. The quick access ticket pocket and a large zippered front pocket provide storage for last minute items such as magazines, newspapers, sweaters and coats. As the leader in the market of innovative luggage design and the inventors of the original Rollaboard luggage, Travelpro has been relentless in developing their testing facility in Boca Raton, Florida. This has been to make sure that frequent travelers and flight crews get the highest quality luggage. The company’s in-house testing team carries out a full range of thorough qualification procedures in all of their luggage brands. It is also engineered to support all the needs for performance testing of their development process and product design by simulating usage conditions that are there in the real world. Its style and design earn it 4 out of 5 stars due to its high competitive ability among luggage bags in its class. The Maxlite 4 has a unique style of construction that enhances a more dependable exterior without the need for a case made of hard-shell. This is extremely paramount as you get a flexible canvas which makes it possible to pack the bag into a smaller space with a hard shell’s protection that’s reliable to keep your carry on safe. The honeycomb frame and foam made top layer creates a durable exterior and maintains its lightweight feature. Travelpro Maxlite 4 is designed with durability in mind. This bag has a sturdy telescoping handle and durable self-repairing zippers although Travelpro’s Magna line has sturdier features which make it ideal for airline travel. The Maxlite 4 foregoes the reinforcing of the pack panel middle which saves on weight but obviously makes it susceptible to durability issues. Most other bags of the parent company, Travelpro, have frame sheet on the entire length of the bag, which the Maxlite 4 does not have, but this allows them maximize on their lightweight features. However, there is a 6-inch frame down from the top and bottom up which give the bag structural support. There is also a 9-inch frame comprised of real fabric found in the middle of Maxlite 4’s back panel. One of the best things any company can do is stand by their product and Travelpro does exactly this by offering a lifetime limited warranty of the Maxlite 4 that covers damage which may result in defects in craft and materials. However, the damage which can be as a result of normal wear and tear or an airline carrier is not covered. Taking durability into account and the warranty as compared to other luggage bags of its class, Travelpro Maxlite 4 earns 4 out of 5 stars for durability. 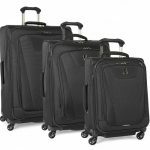 As far as mid-level luggage goes, the Travelpro Maxlite 4 is grooved which makes it easier to have a grip on them. While travelers usually carry them using the extendable handle, Maxlite 4 has other options to transport them easily. It does not have as many features, but the expanding zipper does its job perfectly which enables you to pack more when needed. This comes to play when you end up buying extra souvenirs on your trip and don’t quite have adequate space or the stuff that you brought initially, magically inflated in size. All you have to do is unzip the expansion zipper and check your luggage. The Maxlite 4 comes with twin mesh pockets in its main compartment and compression straps which are non-elastic. 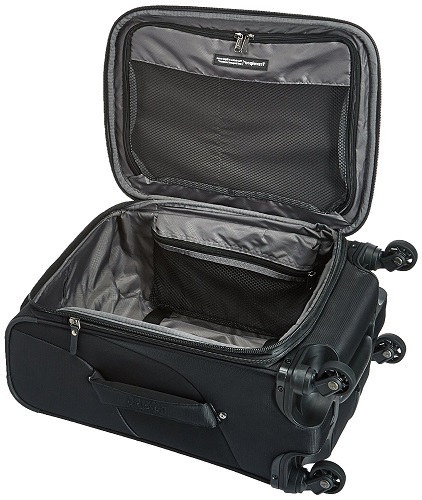 You may have to look for other storage options, like the Travelpro Maxlite 4 rolling carry-on garment bag, if you want to keep your beautiful dress or suit free of creases and wrinkles as this bag does not have a folding compartment. If you lack storage of your laptop, this is the luggage to purchase as it has a deep enough exterior pocket to carry a laptop up to 16 inches. The pocket, however, makes the bag more prone to tipping over if you are using the Rollaboard. Unfortunately there is no dedicated laptop padding so we recommend a computer sleeve. The Maxlite 4 is obviously expandable which is a bonus and a solution to the problem of refitting a carry-on that initially packed neatly but now needs a little extra room. You can just unzip the expandable zipper although it might mean that on your trip home, you might have to check your carry-on if you pack too much. That’s the benefit and disadvantage of an extra seven liters to use. If you need some organization or you’re just a neat freak, consider user packing cubes to neatly organize your luggage. 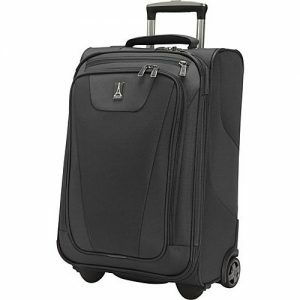 The Maxlite 4’s bottom has a pull handle which is ideal for tugging the luggage out of tight spaces. You’ll notice that there is some weight to the luggage but not much. In the luggage bag industry, the lighter, the better. Although the Maxlite 4 may sacrifice some aspects of durability to help make it lighter, that achieves a huge draw for the bag by as lighter luggage means the more you can pack! The Rollaboard wheels of the Maxlite 4 are much bigger than in most four-wheeled versions making it easier to pull on a rough terrain like a gravel road or in a bumpy parking lot. The bag also has a top and side handles making it easier to tackle a flight of stairs or remove it from an overhead storage compartment. The handles are covered with a gel-like padding which enhances the grip. The one disadvantage of the side carry handle is that it gets caught up occasionally on the edges of the airline seats when you are pulling it down the aisle. The real benefit of the Maxlite 4 in transport is its rolling ability thanks to its lightweight engineering. The big twin or four spinner wheels, padded handles, many compartments and lightweight features give the bag a competitive edge among its peers and earn it a 4 out of 5 star rating. The Travelpro Maxlite 4 is ideal for general airline utility, and specifically for heavy packers or longer trips. The expandable features which are incredible prove to be priceless to users who want more versatility. As far as midlevel bags go, the Maxlite 4 is very friendly on your wallet and should give adequate support to the regular travelers who only need a reliable standard set of luggage. 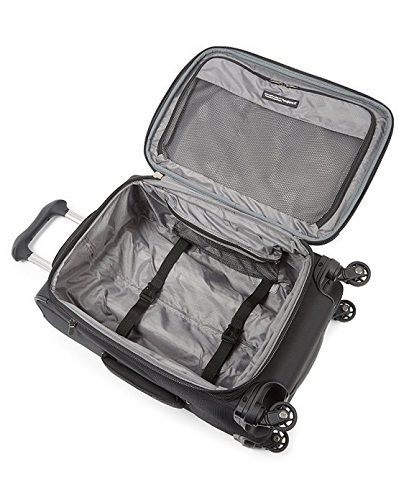 It’s very durable, comes with more than enough space for all that you will likely need for several days away, and it is very friendly and easy to maneuver. If the bag is used by professionals who spend their lives flying all over the world, then certainly this luggage set should be able to handle most traveler requirements. Taking into account is various versions and great price the Travelpro Maxlite 4 gets an overall rating of 4 out of 5 stars!